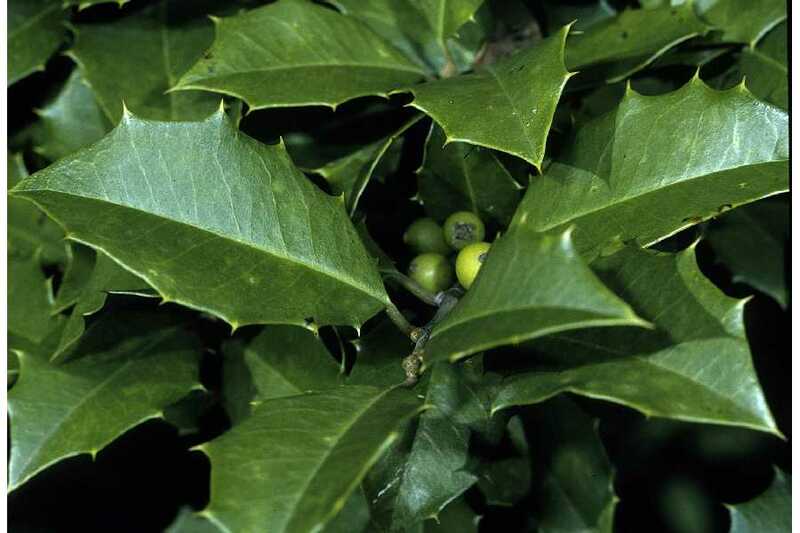 The aristocrat of evergreens, this very deer-resistant holly has been overshadowed in recent years, although the popularity of the plant remains strong. This pyramidal tree keeps its vibrant fruit through the winter when the red of the berries contrasts against the green foliage and is a striking specimen all year. Most become stately, handsome trees over time. To set fruit, a male pollinator is needed. They grow well in full sun or partial shade. Cultivars listed are hardy to Zone 5 unless otherwise indicated. Standard sizes for shipping are one quart (6" to 12” plants), one gallon (12" to 18" plants), and two-gallon (18" to 24" plants) containers. See below for all of our offerings. For wholesale inquires, please click here. Click here for a United States Zone Map. Has a more narrow stance than other opaca varieties with lighter red fruit, medium green leaf color and size. Matures at 30'. Clean, flat, oblong, glossy leaf. Good quality plant, cardinal red fruit, ideal for orcharding (cut branches). Matures at 40'. Developed at Rutgers University. Oval leaves are glossy black-green, off-set by dark red globe fruit. Narrow grower. Matures at 30'. Good dark green leaf with the largest berry of the species, Chinese red fruit. Reliable grower and fruiter. Matures at 30'. Low spreading plant, to 6'. Shy fruiter. Grows to 2' tall. A rapid grower with hardy bright red fruit. Good landscape specimen. Matures at 40'. This recently-registered opaca is a lovely plant and a very fast grower, averaging 12″ to 15″ growth annually. Dark red fruit. Matures at 40'. Vintage, reliable variety, slower-growing opaca with oblong cherry fruit. Good orcharding plant (for cut branches). Adapts well in both northern and southern climes. Matures at 40'. The name says it all! Dark leaves and very winter hardy. A first-rate plant and an industry standard for years. Matures at 30'. Move over “Old Heavy Berry.” Has a tortoise-shell leaf and large orange-red fruit; open grower. An eastern U.S. favorite. Matures at 35'. Leathery light green leaves with clear yellow fruit. Matures at 25'. A Longwood Gardens introduction, this handsome plant produces bright yellow fruit. Matures at 25'. Strong conical grower with grapefruit-colored berries. Matures at 35'. A Holly Ridge introduction into the opaca family. An unusual berry color of bright orange/yellow into peach. Grows in part shade. Matures at 20'. True American Holly look with dark leaves and large red fruit. Matures at 40'. A rapid, dense grower with deep green leaves and large red fruit. A Holly Ridge favorite. Matures at 40'. Grand-dame of the holly world, with nice spring green leaf and round matte red fruit. Matures at 30'. Strong male pollinators for all opacas. Make especially good companion plants for Pride females. Matures at 35. Variegated with white to yellow margins. New growth is often pink. Female, but light fruiter. Great for cut branches and wreaths. Olive colored leaf with many small spines with white variegation. Compact, globe grower that grows to only 2' high by 3'-4' wide. Small, globe shaped, evergreen holly with flat elongated, serrated leaves. Adapts well to shade and heavy soils. Very Hardy. Grows to 4'-5' wide and 6'-8' high. Will often loose bottom foliage, which can be rejuvenated by interior pruning. Good to Zone 5. Fruit if any is black. Improved strain remains dense at early age with dark green leaves. Graceful mounding plant which needs little attention. Will grow into Zone 4. A somewhat slower growing variant with a smaller leaf than the above varieties. Very Hardy. The evolution of this plant over the last twenty years marks it as the most popular of all hollies on the market today. This versatile shrub grows to at least six rounded feet with dark blue-green leaves. This plant must have well-drained soil as it is prone to root rot in heavy soils. CAUTION: DEER GREATLY ENJOY THIS PLANT ALL YEAR ROUND!!! A brand-new holly cultivated by Holly Ridge Nursery, distinguished by its chocolate new growth. Can be grown as a hedge or conical upright. Pollinator for ‘Blue Princess.’ More cold tolerant than earlier varieties. A vigorous grower with clusters of bright red fruit, contrasted nicely against dark blue-green foliage. Will grow to 8' x 8'. Beware of my very sharp claws but embrace my narrow pyramidal shape and dark red fruit. Really, I won’t bite. I also need the male boy toys. What weaklings! I grow to a conical 20' and can take care of the ladies. I’m a bargain at any price, if I say so myself. Unusual and not readily available, this hardy upright evergreen has ficus-like leaves and cherry red drupes. It loves the shade and protected (out of wind) sites. Needs both sexes to produce fruit since no other Ilex is blooming at this time. These deciduous hollies are best known for their attractive fruit, which colors by October and lasts through January (until the cedar wax-wings or robins gobble them up – or wild turkeys!). They are grown in the trade for cut florist stems at the holidays. Great Eastern native restoration plant. Thrives in moist, heavy, wet soils but must have a good amount of sun. Early bearer of golden orange fruit. Good until Thanksgiving then drops its fruit. Jim Dandy pollinates. Male pollinator for Aurantiaca and Red Sprite. An introduction from Holland with long straight stems, excellent for flower arrangements. Jim Dandy pollinates. True dwarf with handsome compact form and large red fruit. Jim Dandy pollinates. An upright vigorous grower with spectacular, smaller carmine red fruit. The best plant for floral sprigs. Apollo or Southern Gentleman will pollinate. Late male pollinator good for Winter Red, Winter Gold, or Sparkleberry. Has become the industry standard. Matures at 12' with tons of cherry red fruit. Always dependable. One male is good for 5 females and should be planted within visual range for best fruit set.